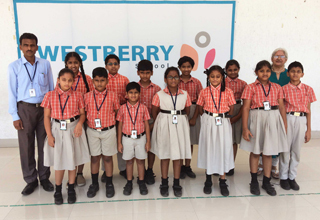 We are very proud to share that our Westberrians have bagged 7 Prizes under 8, 10 & 12 year categories in the District Level Competition conducted on 31st July 2018 in Guntur. 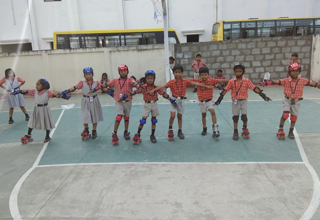 Gold - 1 - Nirupam, Silver - 5 - Praneeth, Avigna, Jagan, Thamogna, Chaturya and Bronze - 1 - Pranav. We got the overall championship of Runners. 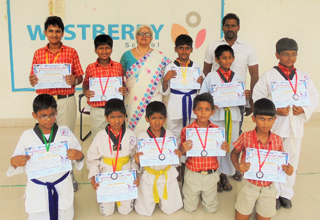 Here is another feather of Achievement by Westberrians..... Our Children bagged 11 Medals in the District level Taekwondo Competition, conducted by New AP Taekwondo Association in Repalle on 29th July 2018. Among the achievers, 2 Gold Medalists - Rishi Ajay & Thamogna got selected in the State Level. 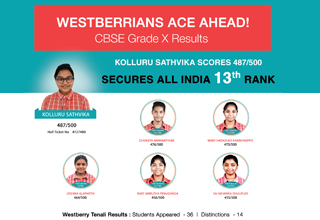 Hearty Congratulations to all the Achievers. 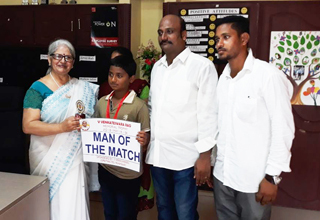 Vishwak Sen of Grade 6 got selected for Under 14 Andhra Pradesh 20-20 Cricket Team. 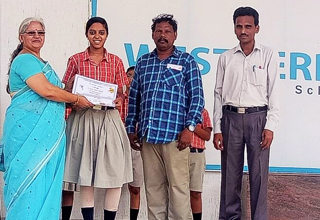 Shreya of Grade 10 wins 1st prize in an Art Competition conducted by PlayKaart in Vijayawada. 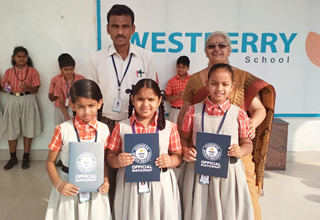 4 students bagged Gold medals and 9 students won Silver medals in the Art Competition conducted by Dream Young & Children’s Art Academy Fine Arts Foundation Trust. Brindasree, Joshika, and Praneetha have been listed in the Guinness World Records for their Kuchipudi Dance performance conducted by University of Silicon Andhra (USA) and organized by Andhra Pradesh State Art & Cultural department. Among 6117 Kuchipudi Dancers participated from across the nation. 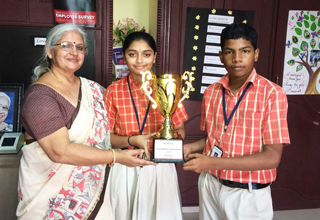 Sai Anand of Grade 8 & Niharika of Grade 10 clinches 1st and 3rd place respectively in Memory Mantra Competition from among 200 participants from across Tenali. 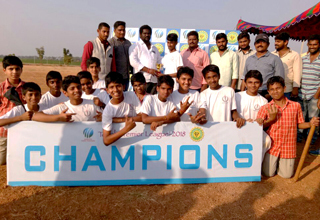 Westberry cricket team won Tenali Premier League Cricket Tournament. 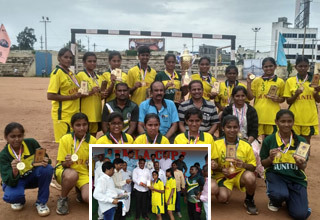 They participated among a total of 8 teams from different schools in Tenali. 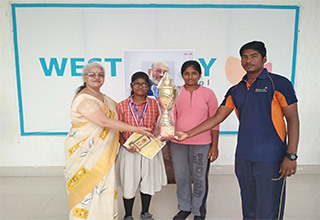 Among 180 participants from 5 districts of Andhra Pradesh; 9 Westberry students won 2 Gold, 3 Silver and 4 Bronze medals in the Skating Competition conducted at Amalapuram GMC Balayogi Stadium. 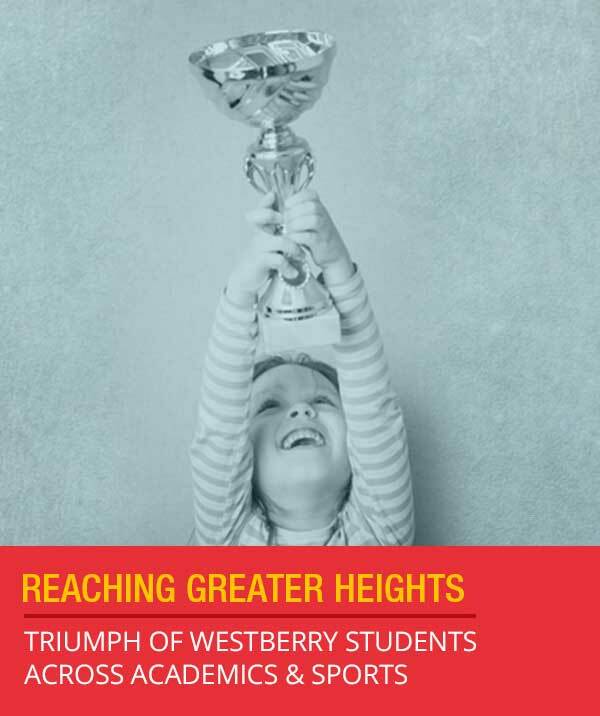 Each of the 27 students from Westberry bagged medals in the Science & Math Olympiad. 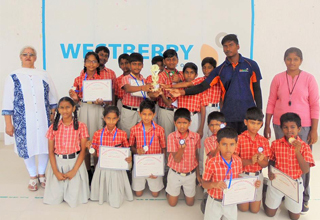 Received 15 Gold, 6 Silver and 6 Bronze medals, among which the Gold medal achievers made it to the next level Olympiad exam.